Always wanted to know what it’s like to be part of Team Tatty? Well now's your chance! 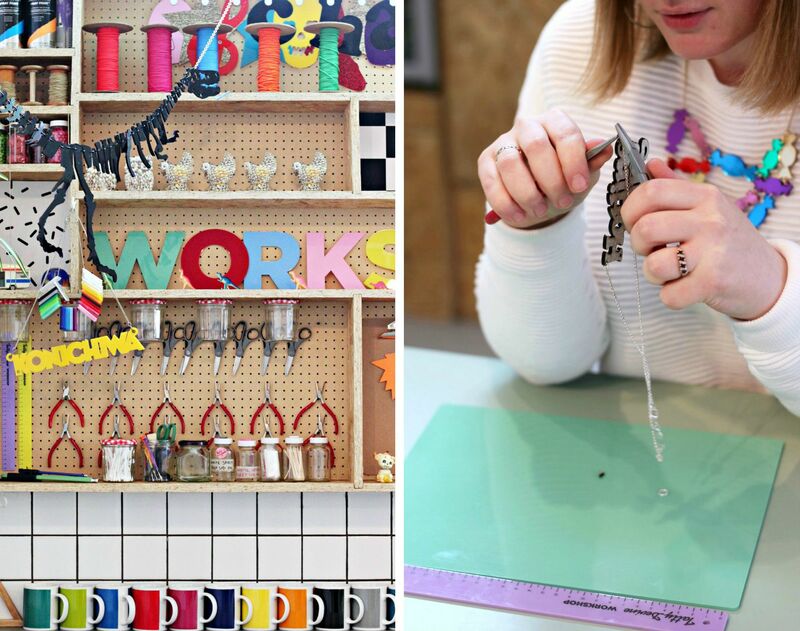 In today's Meet the Team, we talk to workshop extraordinaire, Charlotte. Tell us about a typical day for you at Tatty Devine... I swap between our Brick Lane and Covent Garden stores, so I never know what to expect. 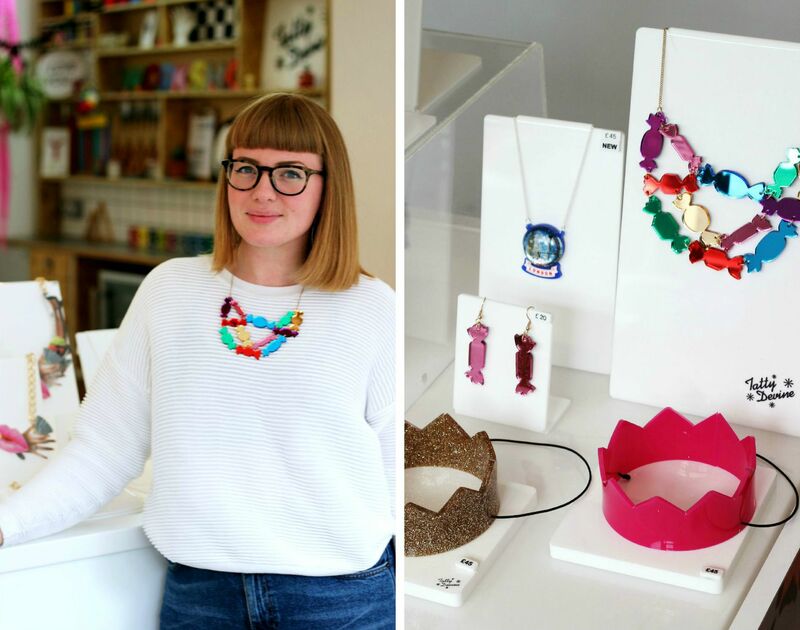 I could be making Name Necklaces saying ‘Feminist’, sourcing sweets and prosecco for our Jewellery Making Parties or attempting to hang a piece of giant jewellery bigger than me. There’s no typical day! How did you get your job? I joined Tatty as a helping hand making Tape Measure Rosette Brooches at the Museum of London, back in 2011. One thing led to another - I joined the Brick Lane store team, continued to help out with events and now I'm a Workshop Supervisor (eek!). 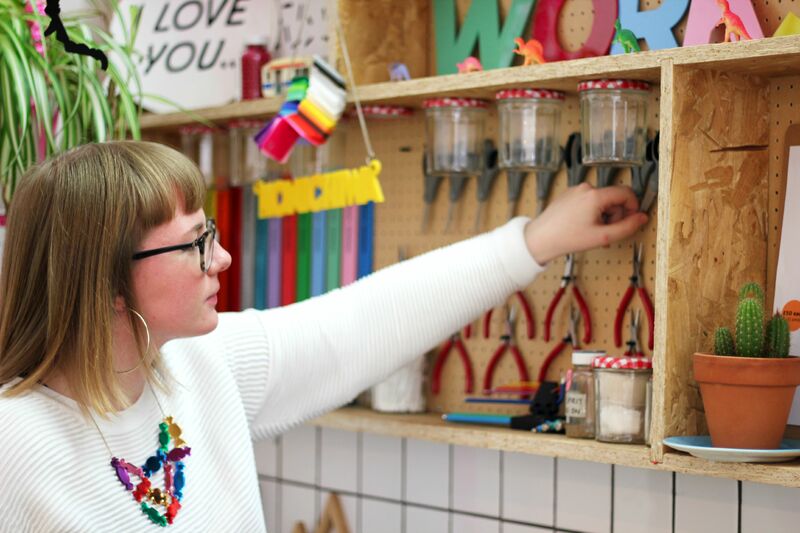 This year our workshop space had a colourful makeover filled with a rainbow of mugs, pet cactus and some seriously stylish angle poise lamps to assist plier wielding. Where do you find inspiration? I’m finally getting round to framing all the prints and paintings I’ve collected over the years - my favourite is a HUGE cinema poster for the film Dark Days, which I won in an eBay bidding war years back. It’s so big, I haven’t been able to do anything with it until now. I wish I could channel a minimalist Mid Century Modern style flat, but I’m too much of a hoarder. Retrospect Finds is ace for enabling my obsession with 1970’s orange home wares. Best thing about your job? It has to be the ace customers we encounter on a daily basis, you always meet real characters; from the proprietors of ‘Strangeways’, Glasgow’s finest Morrissey and Smiths’ night, to ‘My Mad Fat Diary’ star, Sharon Rooney! Tell us something we don’t already know about you... When I was little, I really wanted to be a 'Young British Artist'. My mum worked at Tate Britain in the 90's and I've got a cool picture of her in a hazmat suit installing Damian Hirst's infamous 'Mother and Child' piece. I inadvertently ended up going to a lot of parties and selling highlighter drawings to drunk people for a fiver... it just looked like a laugh, really. Which album do you currently have on repeat? I've been listening to Drake's 'If You're Reading This It's Too Late' too much, so had to make a Drake inspired Name Necklace! It says 'Hotline Bling' after one of my favourite tracks from the album. I went for Ladybug font in our new Atomic Print with a Bubblegum pink heart - it's got a cheeky 'calling your crush late at night on a massive 80's phone' vibe. Earliest Tatty Devine memory? Back in 2006, I stumbled upon the Tatty stall at the V&A fête, it was decked out to look like you were in deep space and I left hooked. The first pieces I bought were the Scorpion and Astronaut Necklaces, they’re meant to look like twinkling constellations. 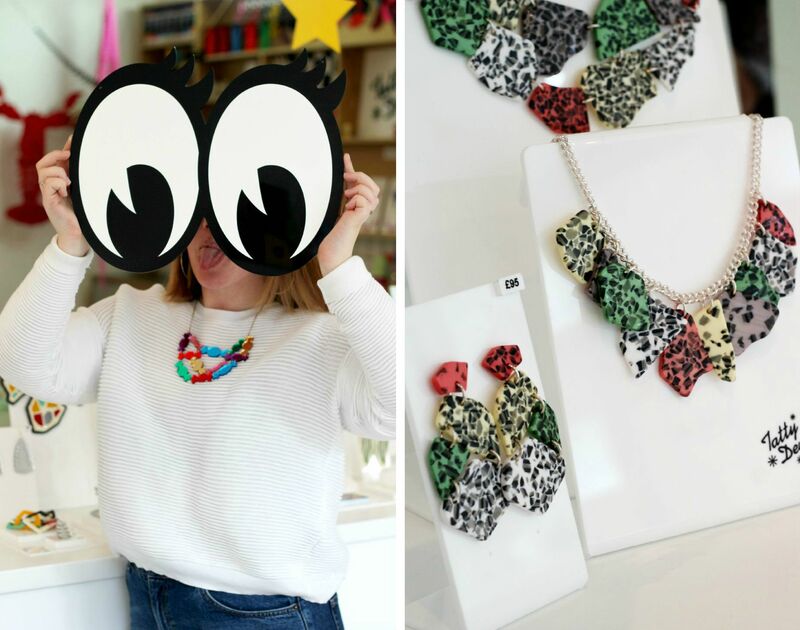 Top Tatty Devine pieces from our autumn collections? I’ve already snapped up the Eighties Graphic Earrings, Crazy Paving Earrings and Sweet Wrapper Necklace. Now I’m eyeing up the Atomic Brooch and gold glitter Crown Party Hat, too! Have you got any fun plans for the weekend? This weekend I'm heading on#TattyTour, but next weekend I want to finish my current favourite book, ‘Concretopia: A Journey around the Rebuilding of Postwar Britain’ by John Grindrod. Then I’ll head to Grace and Thorn on Hackney Road and buy a big, leafy plant. It’ll equal out all the concrete and steel I’ve been reading about, I just hope I remember to water it!